How easy I imagine it would all be then. It is 11:44 on a July 4th evening and I am having a conversation with myself. I have been to the lake & back, leaving before the boats headed to the middle of the lake for 360 degrees of fireworks, leaving the music behind, wanting to be home, wanting to check on Maggie - just wanting to be home. Grateful for the plate of cherries & blackberries & strawberries, but just wanting to be home. It just be's that way sometimes. I stopped & bought morning glory sparklers on my way back & the lovely, lovely Katie & I drew circles in the hot Texas night before she headed upstairs and I headed in. A quiet 4th this year, not unwanted, a 4th that seemed to need some peace, some silence. And so I sit here propped against a mountain of white pillows, the sound of the air conditioner keeping me company, and I feel a bit of contentment begin to settle in. Just a bit, but a bit is much welcomed. 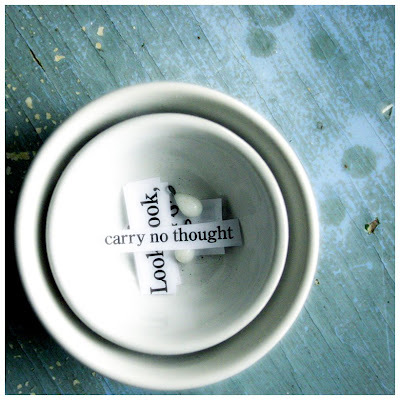 I would like to carry no thoughts. Or perhaps just fewer thoughts, none seeming impossible. They are weighing me down, all these thoughts, making it impossible to float on water or fly into the sky. I see myself in that sky, floating on my back in the air, and attached to my arms & legs & fingers & toes are hundreds of tiny thoughts, anchors caught in the treetops and on telephone wires. I need to start snipping some lines, jettisoning old cargo, letting some things go. I don't mean Maggie, I don't mean important things, I mean things & even relationships that have outlived their usefulness; people with whom I no longer have anything in common, who no longer feel right in my life. Life is too short, Mary once told me, and if the movie is bad, you should get up & leave. A new goal. A new bit of unfurling that I thought would feel sad, but surprisingly does not. It feels freeing. Next week I begin to Unravel. i lost a friend today - my choice, his actions. i can breathe. elk - back at you. The heat has been wearing, so exhausting - perhaps that added to the need for stillness. Today is such a change - rain & in the 80s. Have you been performing raindances up your way? If so, muchas gracias! You know, I seem to have been in that same silent space off and on all week. I guess I can't really call it silent, since it's been interspersed with quite a lot of noise. Still. I have been feeling quite. Especially today. I also really love Mary's advice, it's apropos for me right now. if the movie is bad, you should get up & leave. I will be eager to hear more about your process of unraveling. I meant "quiet" not "quite", but you knew that already. Relyn - I'm glad you're back. I read your post on paper but haven't commented yet - I'll be back. Sometimes I have to ponder things. LOL! One of the best pieces of advice Mary ever gave me. Yes, very much so. Apargaha. Lao-Tzu says that we shape the clay into a pot, but it is the emptiness inside that holds whatever we want. And thus, we need to purge to lighten the the load and to cease the hoarding of so many thoughts and unnecessary things in life. It clears the path so you can better see the journey ahead.